A great way to ensure that your family has access to high-quality produce at a reasonable price is by joining a community supported agriculture (CSA) program. These groups, which are springing up so quickly that many farmers must turn people away, are composed of individuals and families who purchase “shares” in a farm. Shareholders pay money up front, prior to the growing season, to enable the farmer to invest in quality plants, labor, machinery, fertilizer, pest control and many other aspects of farming. In a sense, the shareholder not only assumes the fruits of the farmer’s labor, but some of the risks too, which can include weather damage, drought, and other unexpected conditions. The farmers’ ready cash, however, enables him or her to plant hearty crops and take the best possible care of them. Thus, problems with seasonal crop yields tend to be few and, if they occur, are usually resolved during the following season. Some CSA programs have farm pickup, others have CSA program managers/workers pickup the produce and take it to a central location. All depends on the size, capability of the program. At others, after harvesting crops, the farmer takes them to a central location where shareholders pick up their share of seasonal food. Many families say that a share is not only enough to feed their family of four to six, but enough to feed an army! Many families will choose to “share a share” with another family by alternating weeks for pick-up. Most CSA programs also offer half shares, which are typically suitable for a couple. The produce or meat, cheese, grains, flowers, and pies—all depending on the CSA you choose—are only one of the benefits of belonging to a CSA. The friendship, learning, recipe swapping, and the fun of hosting a produce pick-up or taking a trip to the farm are terrific experiences, especially for kids. Although it involves a several hundred dollar cash layout, the benefits and over-time savings of CSA membership accrue and are evident when the unbeatable produce starts arriving. It’s a great way to get your family some hands-on experience with plant foods and a great way to get kids curious and willing to try more types of fruits and vegetables. How does one join a CSA? Many churches, synagogues and community organizations have begun CSAs. 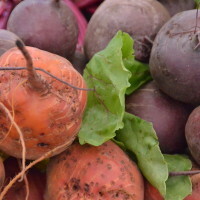 To find a CSA near you, visit www.localharvest.org. Learn how to colorize your diet with all your new CSA produce. Follow us on facebook for daily nutrition and fitness tips!